I suspect I am not the only person on whom David Marr has grown over the years. Perhaps best-known for his biography of Patrick White, Marr’s work has broadened and deepened in recent years, turning him one of Australia’s most insightful cultural and political commentators. In recent years, Marr has published Quarterly Essay biographies of Tony Abbott, George Pell and Bill Shorten. Listen to Marr’s ABC Radio National “Conversations” interview with Richard Fidler (13 November 2018) for a preview of his book’s contents. In this week’s Sydney Morning Herald (29 December 2018), Shane Wright writes: “Capital cities are eating up the rest of Australia. Already home to more than two-thirds of the nation’s 25 million residents, each capital city will soon dominate their respective state or territory in a way that will challenge Australia’s economic and political landscape.” Capital city populations became dominant in 1916 in South Australia, 1921 in Victoria, 1942 in Western Australia, 1954 in New South Wales and 1991 in the Northern Territory. It’s projected to take place in 2027 in Queensland and 2040 in Tasmania. The social, political, economic and cultural implications of this national demographic shift is profound. It’s also one cause for the political restlessness of non-metropolitan Australia, with increasing numbers of non-major party politicians winning seats such as Cathy McGowan; the further you get from the state GPO, the higher the disillusioned minor party vote. That’s the context of Gabrielle Chan’s book Rusted Off: Why Country Australia is Fed Up. Born to Chinese immigrants in Sydney, Chan became a journalist and moved to western New South Wales in 1996. She separates the book into 2 parts (“Shedding my city skin” and “The politics of country”) and 19 chapters – which she calls “lessons”. Examples: 1. WTF? There are people west of the divide; 2. Place is everything; 5. There is an education divide; 7. Not all kids want to go to uni; 11. Rural politics is stuck in an old model; 15. The economics of a small town are tricky. Listen to Chan’s interview with Philip Clark on ABC Radio’s “Nightlife”. The United States of America has always fascinated Australia, however during the last two years – since the ascendancy of President Trump – the need to understand what is happening across the Pacific, and it’s meaning for Australia, has become acute. These two works should assist. Companion piece: Janesville: An American Story by Amy Goldstein, a recent visitor to the Sydney Writers Festival; listen to her Festival talk here. American journalist, historian and environmental activist Rebecca Solnit – author of Men Explain Things to Me, about male arrogance which preceded “mansplaining” – has marked out her place as one of the most original voices on feminism, ecology and the environment and how place matters in the modern age. Her latest collection consists of 20 essays separated into four sections – Electoral Catastrophes, American Emotions, American Edges and Possibilities. The pieces in this collection were all written since 2016 and are thus imbued with a sense of urgency within the shadows of the Trump presidency. Solnit lives in San Francisco, and brings a unique West Coast perspective, compared to the New York-Washington-Boston intellectual approach we are used to. Companion piece: Women and Power: A Manifesto by British classicist Mary Beard. The Wages Crisis in Australia: What it is and what to do about it is a free e-book from University of Adelaide Press, edited by Andrew Stewart, Jim Stanford (a recent speaker to NSW community college CEOs) and Tess Hardy. Read chapter 9, “Contracting out community services, marketisation and wages”, by Fiona Macdonald and Michael Pegg. Wrong Way: How Privatisation & Economic Reform Backfired, edited by Damien Cahill and Phillip Toner, includes 19 case studies of how marketisation has failed Australia. Read Toner’s chapter entitled “A Tale of Mandarins and Lemons: Creating the Market for Vocational Education and Training”, which I reviewed back in November. Why Save the Bankers? And Other Essays on Our Economic and Political Crisis by Thomas Piketty. If you couldn’t bear the idea of ploughing through Piketty’s 816 page Capital in the Twenty-First Century, this short book of his articles and essays from 2008 to 2015 may be just the thing to ensure that you understand this seminal French thinker. Piketty “transformed out economic discourse” (Paul Krugman) and is widely credited with being the person who convinced us that rising inequality is a big story. Although I spend a large proportion of my life reading from (and writing on) screens, I am old enough to believe that books should have physical form. I delight in a well-printed book and have collected … well, let’s just say that I have somewhat more than I need but not nearly as many as I want. 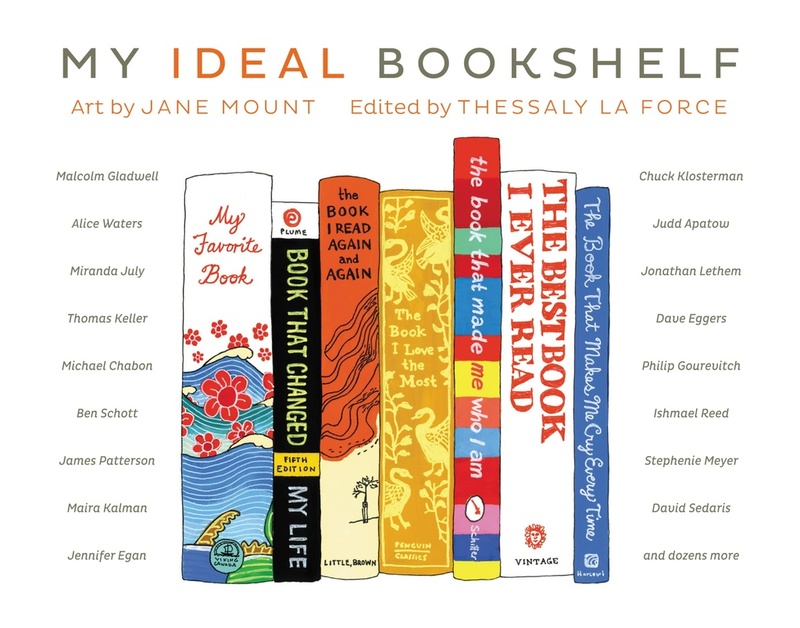 One of the most charming books I have found in years is “My Ideal Bookshelf”, a coffee table book of paintings of “ideal books” selected by a mixed set of 100 cultural figures, from Hugh Acheson to Jonathan Zittrain. “My Ideal Bookshelf” does everything a coffee table book should do: encourage you to pick it up and browse, as well as delight, entertain and stimulate. The paintings (book cover below) by artist Jane Mount are a special delight: clever, slightly quirky, colourful, friendly, warm, clear and inviting. The text – edits of interviews with the 100 contributors – by Thessaly La Force contains enough content to be interesting, but easy to read in a couple of minutes. I’ve probably acquired 150 books just for this project. I haven’t read all of them, and I won’t. Some of them I’ll just look at. But that’s the fun part. It’s an excuse to go on Amazon. The problem is, of course, that eventually you have to stop yourself. Otherwise you’ll collect books forever. But these books are markers for ideas that I’m interested in. That’s why it’s so important to have physical books. When I see my bookshelf expanding, it gives me the illusion that my brain is expanding, too. Like all good books, “My Ideal Bookshelf” also stimulates the reader to go further. I first jumped to my favourite authors and personalities to see what they placed on their bookshelves: film director Judd Apatow (Bellow’s “Seize The Day”, Wolff’s “This Boy’s Life”), writer Michael Chabon (“Dune” by Frank Herbert, “Gravity’s Rainbow”, along with works by Chandler, Cormac McCarthy, David Mitchell, Barthelme, Cheever, Joyce and Melville), Jennifer Egan (Doris Lessing’s “Golden Notebook” and works by Jane Austin, George Eliot, Emile Zola and Edith Wharton), James Franco (Shakespeare, Fitzgerald, Williams, Albee, Melville, Faulkner, Nabakov, Kerouac, Steinbeck and Joyce), Malcolm Gladwell (a set of crime books, his current obsession), Lev Grossman (T.H. White, C.S. Lewis), Lawrence Lessig, Jonathan Lethem (Thurber, Calvino and Leonard Cohen), thriller writer James Patterson (a truly eclectic list), African-American author Ishmael Reed (who I once studied with), humourist David Sedaris (three by Tobias Wolff and two by Richard Yates) and Ayelet Waldman. What a great set of insights as to what has shaped their thinking. What’s next for me? Tracking down many of their favourite books, of course. “My Ideal Bookshelf” was published by Little Brown in November 2012, and is still in print. Artist Jane Mount also accepts commissions to paint your own “ideal bookshelf”, and sells a range of prints. Their website also lists all contributors and their books, with links to the Amazon pages: a lifetime of reading recommendations at your fingertips. Back in September 2014, I made a list of ten books that “impacted me”. Perhaps not quite my “ideal bookshelf”, but a good start. You can read the list here. Not long ago, I was “challenged” on Facebook (simultaneously from Israel and Washington, D.C.) to list ten books that have impacted me in some way, with the following rules: only take a few minutes to pick the books, they don’t need to be great works of literature, but books that have stayed with you. So here’s my book list. It’s not chronological, just the order that they came to me. “A Farewell to Arms” by Ernest Hemingway: I adored Hemingway when I was in high school. Spare, muscular prose, very “male”. But yet “A Farewell to Arms” is terribly romantic. I remember this as his best. “The Fountainhead” by Ayn Rand: Ayn Rand is, admittedly, one of the darling authors of the far libertarian right. This 1943 best-seller is about an architect, Howard Roark, and his striving to express his individualism. Dynamite stuff when you are 17. “The Secret History” by Donna Tartt: Probably the best American college “campus” novel I have read. Neatly captures life at a school (Bennington in Vermont, where I visited once, so I could picture the setting), but adds an intellectual mystery thriller. Great prose, highly engaging, strong characters. I envy people who have not read it already: an experience awaits. “The Death and Life of Great American Cities” by Jane Jacobs: I am one of many for whom Jane Jacobs is an icon. This 1961 polemic attacks the excesses of urban renewal, and voices the joys of mixed neighbourhoods such as New York City’s Greenwich Village. I read it in my first year of graduate urban planning study at UC Berkeley and will never forget it. Do you think Jane Jacobs is outdated? No way, There’s a fascinating current literature analysing her still. “Pilgrim at Tinker Creek” by Annie Dillard is also a UC Berkeley revelation, assigned in a design social factors course by my then teacher and mentor Clare Cooper-Marcus, a landscape architecture professor of uncommon ability, insight and depth. I still have my original copy; it sits about two meters from where I write. What is this book? An poetic essay on nature or a spiritual autobiography? Both and more. The subtitle is “a mystical excursion into the natural world.” It is. “Flicker” by Theodore Roszak is, genuinely, one of the creepiest books I have read. Roszak is a historian, sociologist and a philosopher who taught at Cal State Hayward. He is best-known for his “The Making of a Counterculture”, but he clearly loved film – thus this book. This mystery – loosely based on the life of film critic Pauline Kael – is, thrillingly, back in print. Unbeatable. “Stop-Time” by Pat Conroy is one of those novels you read at age 19 and never forget. I did and I have not. It’s sitting on my bedside table for a re-read right now. “Goodbye Columbus” by Philip Roth has influenced me in more ways than I can count. I am happy to say that I was an early predictor of Roth’s later success, based on this book. I adored “Goodbye Columbus”, and I equally adored the 1969 movie version starring Ali McGraw and Richard Benjamin. Who else has captured suburban American Jewish life better than Roth? Like Woody Allen in film, Roth has covered so much territory that almost every American-Jewish author since gets compared to him. This is his first book, and although possibly not his best, it is one of his most autobiographical. Here’s more of what I have to say about Roth’s books and influence. 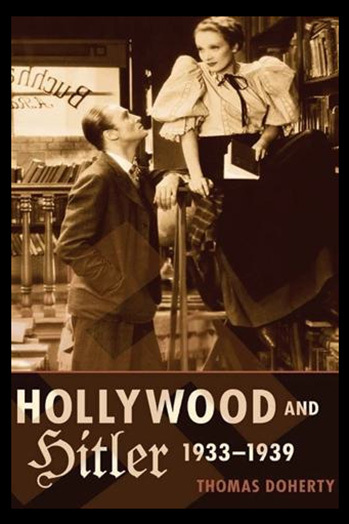 “An Empire of Their Own: How the Jews Invented Hollywood” by Neal Gabler: Some books set you on a twenty year quest. This one did for me. This is, in essence, a “group biography” of early Hollywood Jewish moguls who started film studios. I used Gabler’s thesis for years in my lectures on American Jewish film history, and it has underpinned my film reviewing for the “Australian Jewish News” for more than 25 years. “The Tipping Point: How Little Things Can Make a Big Difference” by Malcolm Gladwell. The world falls into two categories of people: those who love Malcolm Gladwell, and those who are not yet aware of his work. The second category is getting smaller every day. I am part of the first. My copy of “The Tipping Point” is still heavily annotated. I used it for my PhD thesis; I have referred to it in almost every job I have done since it was first published in 2000. I even have a “Gladwell” category on this blog. Need I say more? Four women and six men: not a bad gender breakdown. Five novels – although all of them published before 1993; one autobiography (Conroy), one impassioned essay on urbanism (Jacobs), one historical group biography (Gabler), one poetic meditation (Dillard) and one marketing/social psychology/”new age” business book (Gladwell). This book review of Hidden Talent: The Emergence of Hollywood Agents book review appeared in Media International Australia, issue 136, August 2010. I am re-printing it here so that it is more easily accessible. 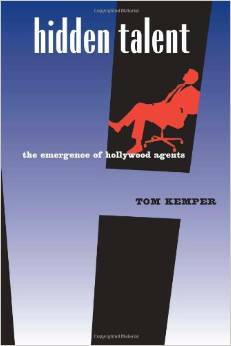 Kemper, Tom, Hidden Talent: The Emergence of Hollywood Agents. University of California Press, Berkeley and Los Angeles, 2010. ISBN 978 0 520 25707 8, xvii + 293 pp. It is hard to believe that before Tom Kemper’s book Hidden Talent: The Emergence of Hollywood Agents, there were no academic studies of the history of agents in Hollywood. It’s not that agents have been ignored: numerous “how to” industry books have dealt with them; Nikki Finke’s tell-all Pay or Play: The Rise and Rise of the Hollywood Agent (1998) charts their modern successes; David Thomson’s The Whole Equation (2005) frequently refers to them; and there have been at least two recent books on super-agent Lew Wasserman. But Kemper stands in a class alone. He easily disproves “the standard conception of film history” that agents only became powerful figures in the 1950s with the establishment of MCA, and then ICM and CAA in the 1970s, and commences his study in the Hollywood studios of the late 1920s. As such, Kemper’s work runs parallel to the historical Hollywood works by Tino Balio, David Bordwell, Douglas Gomery, Thomas Schatz and others, and gives unique and highly detailed insights. With extraordinary detail, Kemper – a visiting lecturer at the University of Southern California – covers the period up to the 1950s, leaving subsequent developments for a future book. Kemper’s great contribution is in showing how agency practices and business models – strategies like packaging, story approval guarantees, percentage points and freelance deals – were all first developed, tested and implemented in the 1930s. Although Hidden Talent deals with a number of different agents and agencies, two agents loom large in the history: Myron Selznick (brother of David O. ), the leading agent of the 1930s; and the contrasting Charles Feldman. Kemper’s chapters take a mixed thematic and chronological approach, dealing with “the power of place”, boutique agencies, the contract industry, agents as producers and then finally the “new fortunes” in the 1940s, and the shift to the “corporate era” of the 1950s. One criticism: While most of the agents of his period are Jewish, Kemper simply avoids the topic, noting that dealing with it is “another project” best left to the likes of Neal Gabler’s An Empire of Their Own and Steven Carr’s Hollywood and Anti-Semitism. But what elements of Gabler’s assimilation thesis applied to the agents? Part of our understanding of how Hollywood ran then is in fact based on both on who they were and why they became involved in the industry, not just how they did their jobs. It is, of course, this “how” that Kemper succeeds in describing, with great breadth, depth and clarity. He has mined extensive archives (accessing materials that will never make their way online) in Hollywood agencies, studios, guilds and associations. There is a lot of loving – and highly illuminating – detail here, such as the inclusion of the floor plan of Myron Selznick’s specifically designed new agency officers in 1938. This one graphic gives us more insight into organisational relationships than many thousands of words could describe. One of my favourite subjects is grappling with my childhood identity of growing up in New Jersey in the USA. What was it about that state at that time (the 1960s)? What makes my former high school classmates (and yes, me) so nostalgic for our experiences, in what was, after all, a place of high pollution, few exciting natural resources (okay, let’s face it, “the shore”, but what else?) and constant living in the shadow of New York City to the northeast, and (to a lesser extent) Philadelphia to the southwest? For some years, Rockland has taught a course at Rutgers entitled “Jerseyana”, with a required reading/viewing list that includes books Philip Roth’s Goodbye Columbus (a classic for we New Jersey-types) and John McPhee’s Pine Barrens along with the film’s Jersey Girl and Atlantic City. The syllabus starts with a quote from Allen Ginsberg’s “Garden State” and and Bruce Springsteen’s “State Trooper”. 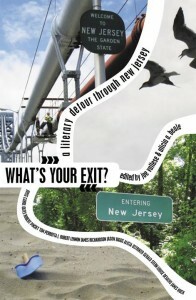 If you really would like to examine what makes New Jersey New Jersey, here’s a strongly recommended book: What’s Your Exit? A Literary Detour Through New Jersey, edited by Joe Vallese and Alicia A. Beale (Word Riot Press, Middletown, New Jersey, 2010). (I found Rockland’s quote above in their introduction, page 17. You can also read some excerpts through Amazon here.) The book is organised, in classic New Jersey fashion, by “exits”, and includes fabulous writing (poetry, essay, fiction, drama) by a large number of authors, including well-known names like actor Jason Biggs, poet Alicia Ostriker, novelist Tom Perrotta, Joyce Carol Oates and of course Michael Aaron Rockland – as well as many many writers you have not heard of yet, but will want to read. And want a good short “potted history” of New Jersey? Try this essay by Rockland, which appeared in New Jersey Monthly in January 2014, written in honour of the state’s 350 birthday. One fun fact from that piece: I bet you did not know that New Jersey’s voters voted against Abraham Lincoln not once but twice – in 1860 and 1864.